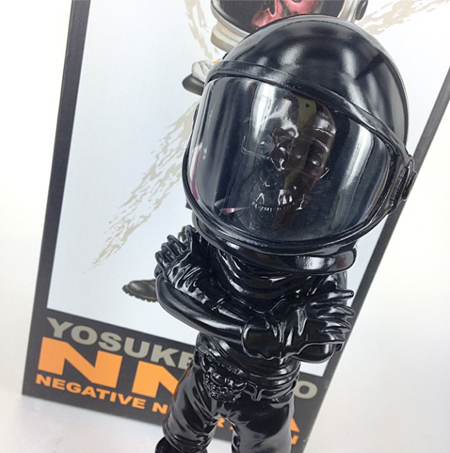 Yosuke Ueno’s Never Negative Again may be making an appearance at this years STGCC, says the folks over at Mighty Jaxx. From what they’ve revealed, we see this awesome all black version. If there so happens to be any available after the event, Mighty Jaxx will have them available online! Get a closer look at Yosuke’s Never Negative Again at the Mighty Jaxx Booth AA84, AA86 & AA88. Sarah Tan aka The Real Firestarter is excited for this years STGCC 2014. You want to know why? 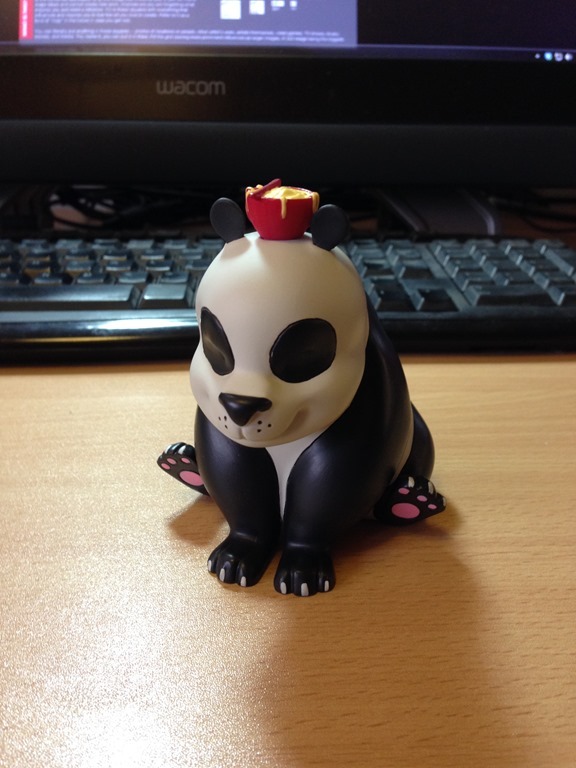 Because she will be releasing her first toy ever, Noodles the Panda! Sarah is a freelancing visual development artist who loves to do character and creature design. For her first toy, she’s created this adorable panda who carries around a bowl of ramen in his head at all times. 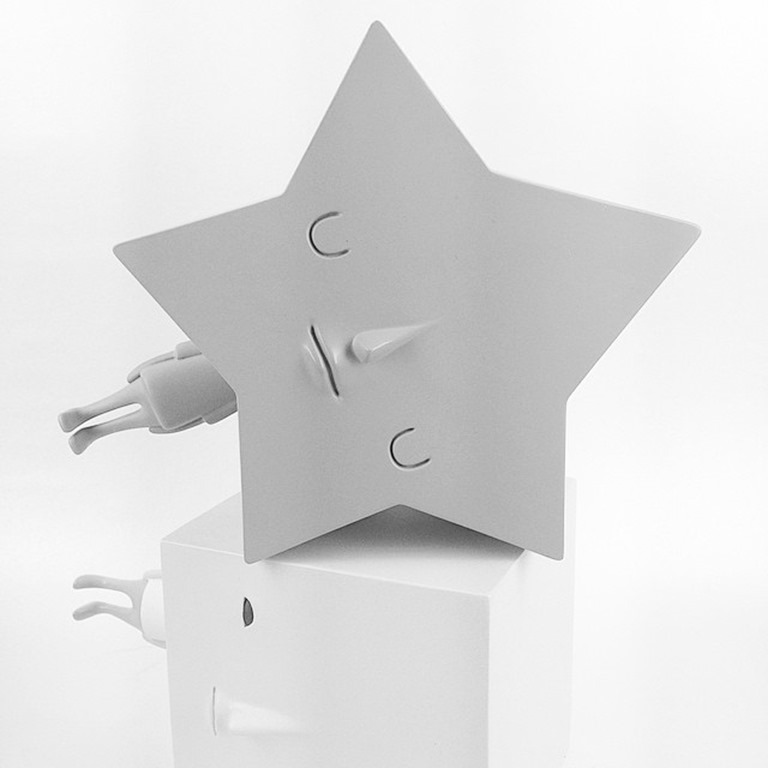 Noodles will first be released at STGCC and is limited to 300 pieces. If you are interested in getting your hands on one of these figures and cannot attend STGCC, be sure to send her an email to renegadedragons[at]hotmail[dot]com after the convention. Each figure measures 4” tall and 3.5” wide, he also comes with a limited edition print and vinyl sticker. Find them available at booth AA34. More photos after the jump. Eisner award winning comic artist Sonny Liew has been working with Mighty Jaxx to translate his striking and sobering 100,000 HP artwork into a bust sculpture. 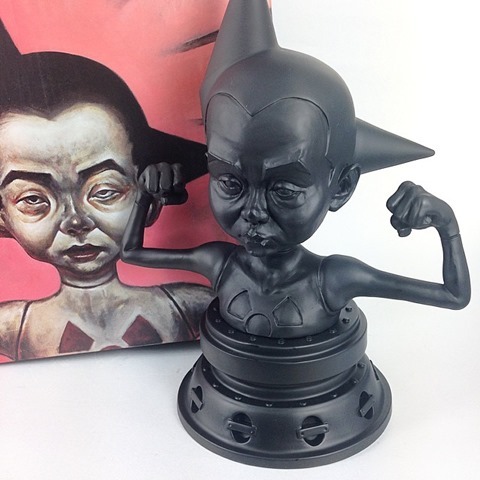 Blending the iconic Astro Boy with the darker realities of the legacy of the atom-bomb building Manhattan Project, the new piece, sculpted by Gary Choo, is eye-catching and thought-provoking. The piece will debut in a matte black edition at the upcoming STGCC (9.6-9.7) from both Liew’s Artist Alley booth (AA1) and the Mighty Jaxx booth. Scott Tolleson will be travelling to Singapore as one of the guest artists for the upcoming Singapore Toy, Games and Comics Convention (STGCC) which runs from 9.6 – 9.7. 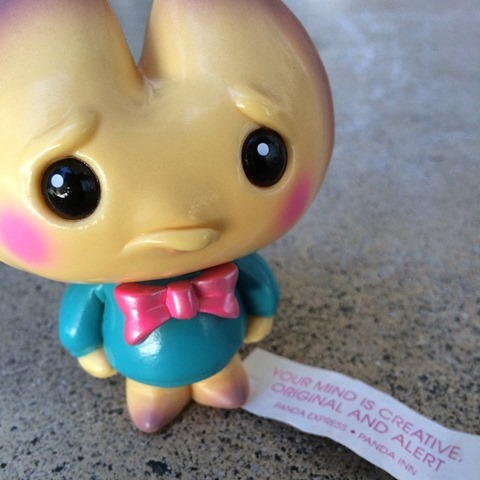 He’ll be bringing his wit, charm, talent and quite a few new toys as well including ‘Kookie So Good’, the latest edition of his mischievous fortune cookie toy with De Korner. The new ‘reformed’ colorway features a fortune-cookie colored base vinyl with a bright blue shirt and pink bow tie, plus a fancy header card. Limited to 30 pieces, the new sofubi will be available for $40 which translates into about 50 SGD. 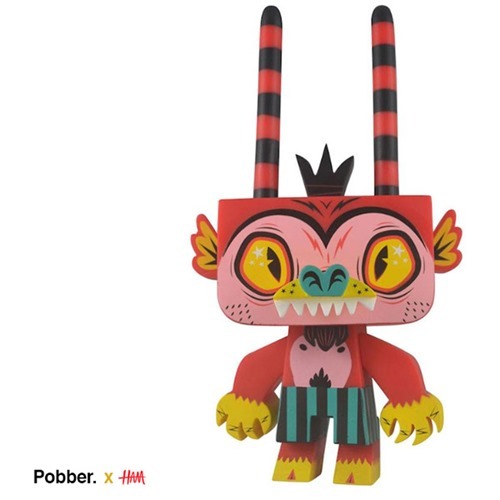 In Singapore for his turn as a guest artistguest artist for STGCC, Angry Woebots has put brush to his brand-new Killer Donut resin from the wild bunch at Flabslab which will debut at the convention. 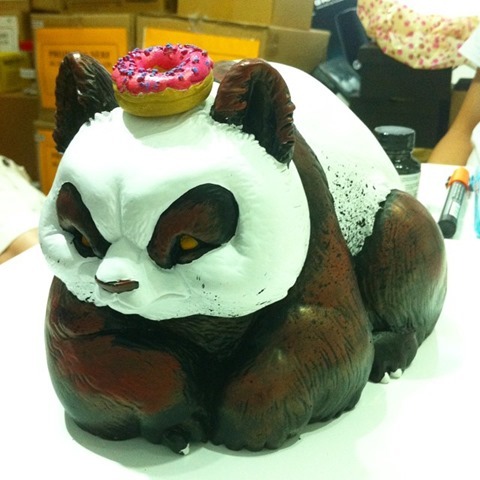 A tribute to Hip Hop Producer J Dilla, a donut crowns the prone Panda’s powerful presence. If you’ll be at the ‘con, drop by Woebots’ booth to pick one up. If not, look for remaining stock online via Flabslab afterwards. Gary Ham’s Sylvan figure will be making its way to STGCC next weekend! This time in a new awesome Firecracker colorway. These should be expected to retail around $70 and will be available at booth AA76 & 78. If there so happens to be any remaining pieces left, we hope Pobber Toys will release the remainder on their online store. With STGCC just one week away, Mighty Jaxx has just announced that Ewokone’s Brainlington will be making an appearance! This new colorway is a run of only 80 pieces and will be available at STGCC, with the remaining pieces available online. Be sure to stop by their booth AA84, AA86 & AA88 to get a closer look! Yoskay Yamamoto’s newest figure with Mighty Jaxx finally has name, “Wish Upon Me”. Who can also be seen above laying upon the previous collaborative figure, Sideways. Those attending STGCC will be able to get a up close look at this resin/wood creation. Stay tuned for future release information on this awesome new figure! Instinctoy will release a small amount of their special Halloween figures early for Singapore Toys, Games and Comic Convention (STGCC, 9.6 – 9.7) and then again at Taipei Toy Festival (TTF, 10.9 – 10.12) before the main online release later in October. This year Instinctoy is releasing two editions of their annual Halloween inc figure (~ 9”) –– Platinum (SGD 210, ~$167) and Gold (SGD 200, $160). The Platinum features a wild purple-hued design with metallic paint, and glitter embedded in translucent vinyl. The Gold features a metallic orange design with gold glitter in translucent vinyl. Both figures include a swappable pumpkin head, capes, and remotes to control the fancy embedded LED light system. And… There’s also a bright pumpkin orange Halloween Muckey (~7.5”, SGD 130, ~$104) with GID details (looks like ears, nose, claws, and Haunted Castle chest logo). Illustrator Alex Solis reimagines Super Heroes and iconic cartoon characters after they’ve consumed waaay more junk food than even their supernatural bodies can handle. Now his ‘Chunky’ series of paintings goes 3D with the upcoming release of the Chunky Knight resin from Mighty Jaxx. The Chunky Crusader will be unleashed at STGCC (9.6-9.7). Now that SDCC is over, STGCC is the ‘con on the minds of collectors. 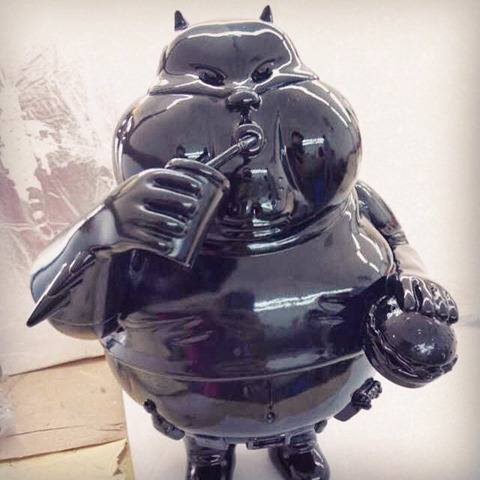 Scott Tolleson will release a new Trajyus resin for the annual show (9.6-9.7) in Singapore. The Periwinkle Trajyus (fancy name!) will be limited to 30 pieces. More info soon.